You Can Teach an Old Dog! I grew up near fields of wildflowers, aka weeds, where siblings and friends played through endless summers. I ran through fields, made forts in tall grasses, played hide & seek, made dandelion chains to adorn our heads, necks and wrists, held buttercups under each others chins to see if we liked butter, made small projectiles from seed heads while chanting, “Mama had a baby and her head popped off,” picked burrs from my socks, blew dandelion seeds, got stung by nettles, and gathered flowers to take home that wilted before I reached the front door. It was an on-site education and I thought I knew my weeds…but a recent educational email from Gloucester Master Gardeners set me straight on one weed. 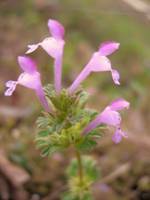 I referred to a common pink-purple flowered weed as Henbit (lamium amplexicaule), when in fact there were two similar looking weeds that grow in the same areas. The other is Purple Dead Nettle (Lamium purpureum). I lumped the two together as all Henbit. Now, looking at them together before the plants fully flower, I can clearly see the difference. Thank you, Ellis Squires! “I am sure you have noticed the empty farm fields carpeted with purple this time of year. To discover the cause, you may have to get down on your knees. There are two plants responsible for these blazes of glory, both are of the same genus in the mint family, have opposite leaves, square stems and lipped flowers. 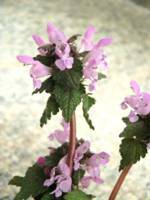 The first is called Henbit, Lamium amplexicaule and is a low-growing annual, growing to 4 to 10 inches tall, with hairy stems. The upper leaves are semicircular, clasping (which is what amplexus means) and opposite with a lobed margin. The pink to purple flowers are in whorls in the axils of the upper leaves. The buds are like little beads of royal purple. It is one of the earliest flowers to bloom and is an important nectar and pollen plant for bees and honeybees. It is widely naturalized in eastern North America, where it may be considered to be an invasive weed. 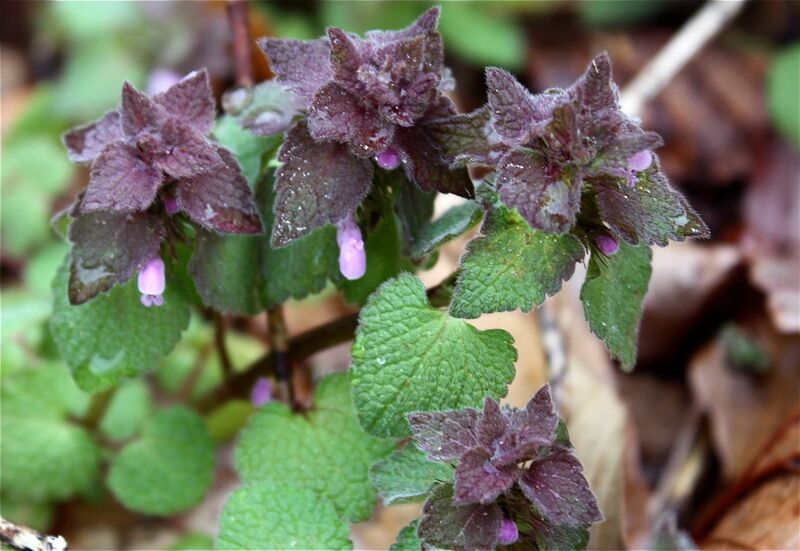 The second species, which will take a dicerning eye to differentiate, is Purple Dead Nettle, Lamium purpureum, which is also native to Europe and Asia. It grows to 3 to 10 inches in height. The leaves are finely haired, are green at the bottom of the stem, and purplish at the top. 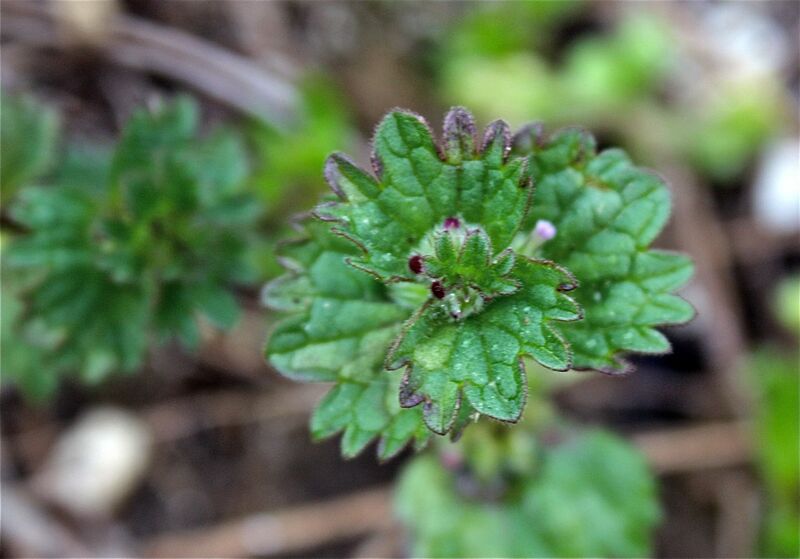 The short petiole on the pointed leaves is one way to tell it from unstalked leaves of Henbit. The bright red-purple flowers have a top hood-like petal, two lower lip petal lobes and minute fang-like lobes between. Bees also find this plant attractive for it is often the only nectar source available in the early spring. This entry was posted in henbit, Horticulture, purple dead nettle, weeds and tagged Garden, Henbit, Lamium amplexicaule, Lamium purpureum, purple dead nettle, weeds by Annie. Bookmark the permalink. All these years pulling this up, I am delighted to give it idenity. Thanks. Of course, in our lawn, we have a goodly show of both these pretty non-native weeds. It was fun to go out and examine them more carefully. The henbit reminds me of a tussy mussie and might help me to remember which is which.